Tillerson confirmed this in a phone conversation with Poroshenko. 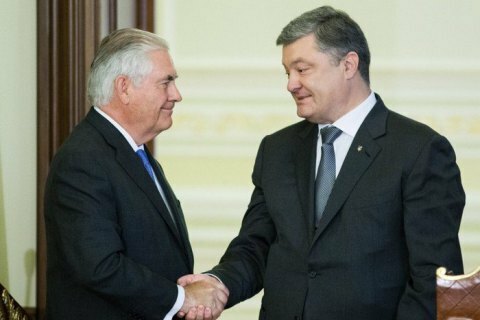 US Secretary of State Rex Tillerson has confirmed over the phone that the White House has decided to supply lethal weapons to Ukraine, Ukrainian President Petro Poroshenko has said on Facebook. "As we agreed with President Donald J Trump, without much noise and quietly, Ukraine will receive lethal weapons from the USA. This fundamental and long-awaited decision of the US administration was confirmed during yesterday’s talk with Secretary of State Rex Tillerson," he said. "Along with strengthening the sanctions against Russia, this step is an adequate response to the continuation of the occupation of the Ukrainian territory, the failure of Moscow to fulfill its commitments, and the continued pouring of heavy weaponry in Donbas," he said. He added: "American weapons in the hands of Ukrainian soldiers are not for an offensive, but for a stronger rebuff of the aggressor, protection of Ukrainian soldiers and civilians, as well as for effective self-defence in accordance with Article 51 of the UN Charter. It is also a Trans-Atlantic vaccination against the Russian virus of aggression".